In the first chapter of Rivers of London by Ben Aaronovitch, probationary constable Peter Grant of the Metropolitan Police Service tries to take a witness statement from a man he doesn’t realise at first is a ghost. Pretty soon Grant finds himself assigned to a secret branch of the police force dealing with magic and the supernatural, apprenticed to a wizard, and witnessing a man dying after his face falls off. Throw in Londoners going berserk, a series of brutal murders, vampires, a turf war between the minor demigods Mother and Father Thames, more faces falling off, and things get even weirder. And then there’s Molly. I don’t know what kind of a being she is, but she’s awesome, and she’s got teeth. This urban fantasy, published in the US under the title Midnight Riot, is by turns gory, strange, sad, puzzling, imaginative, geeky, and sometimes laugh-out-loud funny. It is also deeply immersed in contemporary London, larded with British slang and references to London neighbourhoods and 21st-century culture. I love London, but I’ve never lived there; I know the city only as a foreign tourist, so I’m sure there were some jokes and references that went right over my head. Even so, it’s approachable by someone who isn’t familiar with the city. The story bogged down a bit in the middle, and some of it was confusing, but it kept me entertained, despite the faults, and most of it moves along at a brisk pace. Aaronovitch is a master of throwaway lines and understatement, and sometimes the scenes he describes are better for what he doesn’t say than for what he does. He trusts us, his readers, to be willing to work a bit to read between the lines and fill in the gaps, especially for emotional content, and I appreciate that. 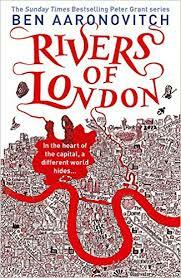 Rivers of London is the first in a series, with another six or seven entries so far, plus several related graphic novels. Be warned that it is rather dark, and this entry in the series does not have a happy ending for one of the main characters. Whether that character recovers or not I don’t know; so far I’ve only read the first book, but liked it enough to put the second book, Moon Over Soho, on my holiday wish list. Audience: Adult. Gore, lots of it, and adult situations. This entry was posted in Mysteries, Urban Fantasy. Bookmark the permalink.